The Best Way to Celebrate Women's Equality Day? Register to Vote! This week as we celebrate Women's Equality Day, we reflect on the brave suffragists who helped secure the passage of the 19th Amendment, which granted women the right to vote nearly 100 years ago. The suffragists who tirelessly advocated for the 19th Amendment knew that our democracy was strengthened by increased access to the ballot box. They knew that voting is the most powerful act a citizen can make. This week, as we mark the 94th anniversary of the 19th amendment becoming law, let's honor those brave women and men by engaging and empowering all voters to register to vote. The League of Women Voters was founded just months before the passage of the 19th Amendment. When the League's founder, Carrie Chapman Catt, spoke at the White House reception celebrating the 19th Amendment, she underscored the power of the vote: "The vote is the emblem of your equality, women of America," she said. "Progress is calling to you to make no pause. Act!" This year, voters everywhere must do exactly that: Act! The first step in doing so is to register to vote or check your voter registration status at VOTE411.org, the League of Women Voters' nationwide voter education resource. The fight for universal suffrage continues today and the League continues to work to secure all eligible Americans' right to vote. In communities across the country, new restrictions are being introduced that challenge voter registration, limit early voting, implement voter photo ID requirements, to name just a few. Leagues in these communities are working both to fight these changes and to make our elections fair, free and accessible, and are also educating millions of voters on changes to elections law that could affect their ability to cast a ballot. Now is the time to learn about important details and deadlines and what you'll need to cast your ballot. 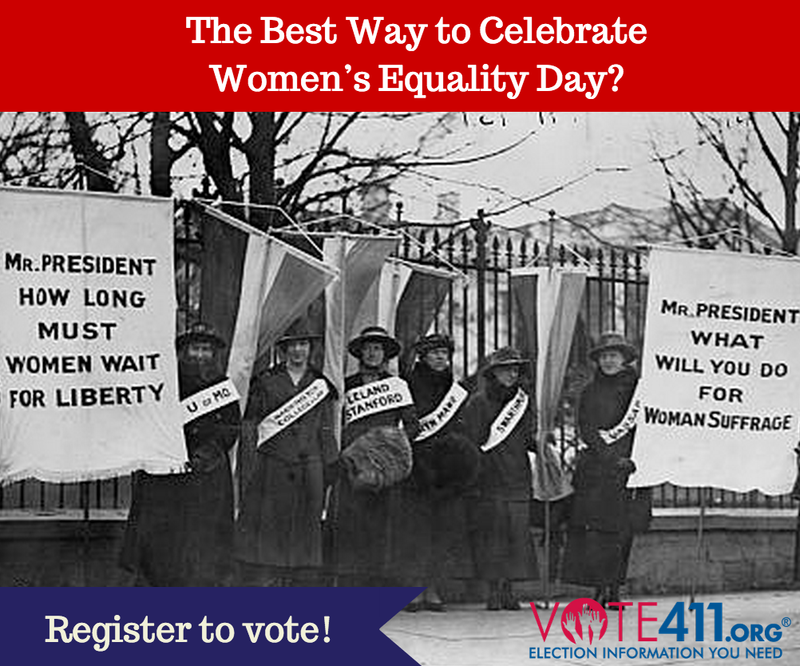 Wherever you live, if you're unsure of what you'll need in order to vote, VOTE411.org has the answers! Enter your address to find your local voting hours, what types of identification, if any, you'll need to bring to the polls and much more. Carrie Chapman Catt was correct when she said that the vote is the "emblem of equality" - but this is true not just for women, but for all citizens. Voting brings us together as Americans - it is the one time when we are all equal. It doesn't matter if you're rich or poor, young or old; Election Day is your opportunity to support your community and have a say in our future. Even though it's not a presidential election year, there are thousands of important offices at stake across the country, including all of the U.S. House of Representatives, many U.S. Senate and Governors' seats, and many state and local offices. The people elected to these offices will have an enormous impact on our lives, so registering to vote and participating in our democracy remains as crucial as ever. 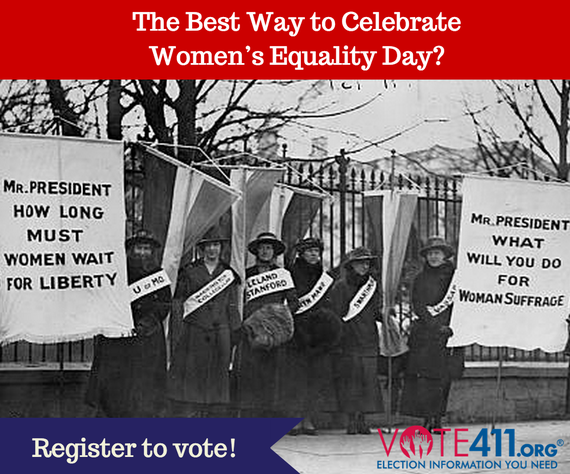 As we commemorate Women's Equality Day, take a moment to visit VOTE411.org to start the voter registration process and visit it again closer to Election Day to learn about the candidates and issues that will be on your ballot. Our foremothers understood that voting provides citizens the ability to have an impact on the critical issues facing their community. Women's Equality Day is the perfect time to get ready and commit to vote and participate in the greatest democracy in the world. "...Make no pause. Act!"